A call to Oscar Romano at Fraser Yachts in Italy brings more details about his latest central listing, the 30.2m motor yacht Avagliani. Designed by Stefano Righini and built to ABS class in 2009 by Benetti, she's hull number 20 in the yard’s successful Tradition series. 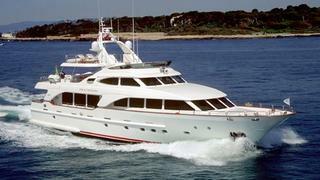 MCA compliant, her Francois Zuretti interior accommodates eight guests in four staterooms plus five crew. Avagliani has twin 1000hp Caterpillar engines powering her to a maximum speed of 14 knots and a range of 2,050 nautical miles at 10 knots. Available to view at the Monaco Yacht Show, Avagliani is asking €6,300,000.